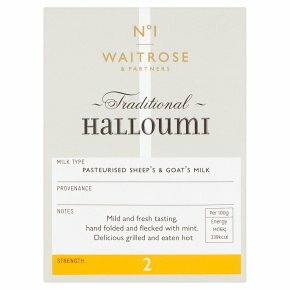 A fresh tasting, firm textured Halloumi iwith mint, hand folded the traditional way in Cyprus Strength 2 made from pasteurised ewe's and goat's milk. The island of Cyprus is known for it's sunny climate, it's typical Mediterranean landscape. studded with cypress trees - and it's favourite cheese, Halloumi. Usually served grilled or fried, it's a staple of many Cypriot dishes, and has been made on the island since at least the 16th century.